Donald Richard Gold, 80, 632 Folkerth Ave., Lot 43, Sidney, Ohio died at the Veteran&#39;s Administration Hospital in Dayton, Ohio on Monday, November 17, 2008 at 7:30 PM of natural causes. He was born March 30, 1928 in Casstown, Ohio the son and Harry and Effie (Allebach) Gold and they are deceased. He was married on September 24, 1977 to Naola M. Douglas and she survives along with eight children, Rick Gold and wife Cindy of Piqua, Ohio; Dorreen Nishwitz and husband Roger of Troy, Ohio; Louise Calland of DeGraff, Ohio; Mary Zwiebel of Sterns, Kentucky; Gary Douglas and wife Gladys of Sterns, Kentucky; Kathy Sayre and husband Bob of Maplewood, Ohio; Brian Gold Sr. and wife Mollie of Sidney, Ohio; and Donna Gold of Jackson Center, Ohio; twenty-five grandchildren, Terry Woodell, Melissa Riddle, Angie Shoop, Sarah Shoop, Matthew McDonald, Zach Douglas, Heidi Douglas, Joseph Carnes, Jennifer Wooten, Jacob Carnes, Brian Gold Jr., Heather Gold, Kohl Todd, Payten Ivey, Madalynn Lundy, Carson Lundy, Kelsey Lundy, Diane Richardson, Kim Nishwitz, Leslie Churchhill, Josh Gold, Sarah Gold, Alicia Gold, Rick Calland and Deb Calland and seven great-grandchildren, Cherika Wooten, Janelle Wooten, Anthony Smith, Alex Richardson, Evelyn Gold, Josephine Gold, and Madelin Gold; two sisters, Donna Spriggs of DeGraff, Ohio and Lorene Wren of Bellefontaine, Ohio and one brother, Deane Gold and wife Sandra of Land of Lakes, Florida; a granddaughter, Jessica Carnes and one grandson are deceased. 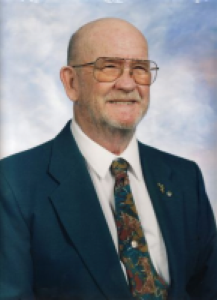 He was a United States Army veteran and a member of the Sidney American Legion. He was a member of the Faith Baptist Church in Sidney. He was an employee of the Stolle Corporation in Sidney for forty years working in the maintainence department. Funeral services will be held on Friday, November 21, 2008 at 11:00 AM at Salm-McGill and Tangeman Funeral Home in Sidney with Pastor Tony Richmond officiating. Burial will be at Rosedale Cemetery, Rosewood, Ohio with full military honors. Friends may call at Salm-McGill and Tangeman Funeral Home in Sidney on Thursday, November 20, 2008 from 4-8 PM and also on Friday one hour prior to the funeral service. Memorial contributions may be made to Faith Baptist Church, 2555 Millcreek Rd., Sidney, Ohio 45365 or the Sidney American Legion, 1265 Fourth Ave., Sidney, Ohio 45365. Envelopes will also be available at the funeral home.